I previously blogged about my Bullet Journal here. 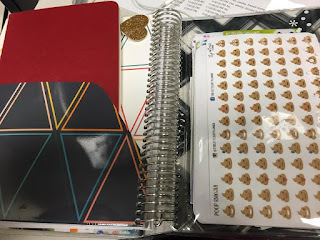 This calendar year, I made a huge change and started doing my Bullet Journal in a more traditional paper planner (specifically, an Erin Condren Life Planner). 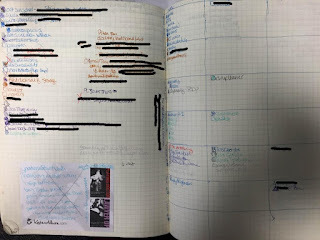 One of the things that wasn't working for me in doing a plain-notebook Bullet Journal was how clunky it was to schedule things and plan ahead. I follow a lot of the Getting Things Done philosophy, so I write down EVERYTHING I need to do, as soon as I think about needing to do it. Because of this, I have a lot of things to plan ahead-- not just appointments and meetings, but reminders to change the library voicemail when we're closing for a holiday and another one to change it back after the holiday ends, or things that need to get done ASAP, but it's 10 minutes until close, so I have to do it tomorrow, or a phone call I need to return, but they won't in in the office until Thursday, or a monthly reminder on the first of every month to pay my bills, or what the various dress up days are this week at my daughter's school. 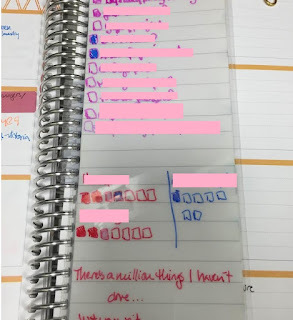 The Future Log function of the Bullet Journal just isn't practical for this also, I wasn't great at actually checking the future log and adding things to my daily list, which defeats the purpose. One thing I also love about a more traditional planner is that as I map out large projects, I can write "hey! this thing due next week!" to help remind me of upcoming deadlines and events. I had hacked this a few ways. In my previous post, you can see where I taped in some monthly calendar print-outs. 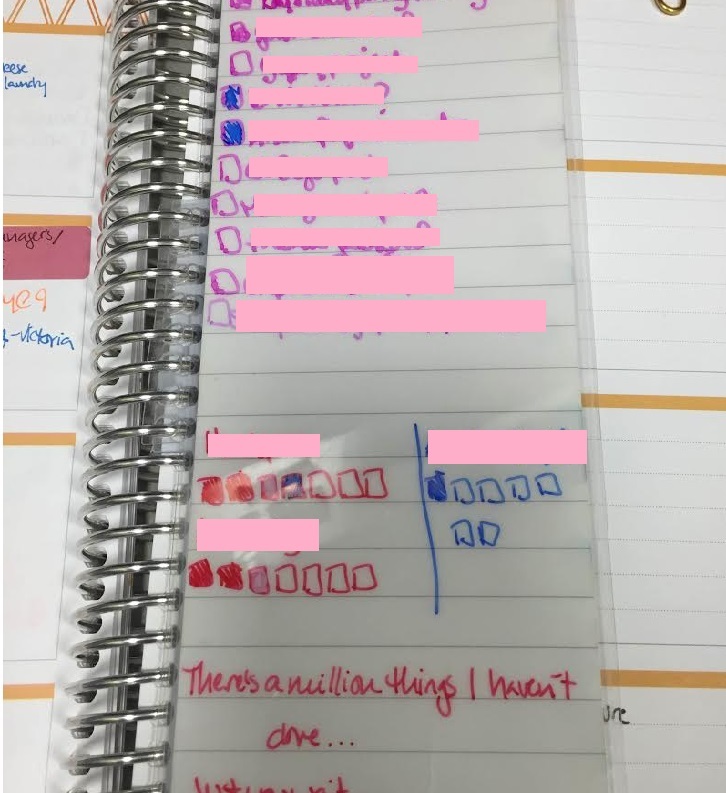 When thinking about if doing bullet journal in a more traditional planner would work, I started making weekly grids that mimicked my greatly missed BusyBodyBook. But... drawing the weekly grid took time and it wasn't pretty, and to be most useful, I had to have many of them all drawn out at once, which just wasn't happening. A traditional planner had them for me. And ones for next week and the week after and the week after that. BUT, that left hand spread was so useful! They have some customization options. Not just the cover, but the insides, too. One thing you can decide is if you want a horizontal layout (like I have) or a vertical. I wanted vertical but messed up on ordering. Ah well. Highly recommended by planner-obsessed friends (who could give me a discount code). The snap-in dashboard. Along with the notes field on the bottom right of the spread, this makes up for the loss of the left hand side of the sheet. I especially like that it travels from week to week without my having to rewrite it, so I can put monthly tasks on here, too. It's really easy to wash clean, but the marker won't wipe off until you make the effort to wash it, which is helpful. Plus, seeing my higher-priority longer-range projects every time I look at my daily list has been very helpful (for me) in terms of actually working on them. Monthly tabs to make flipping through to a certain date faster. It comes with some fun stickers. I don't use a lot of stickers, but I really like them and think they're pretty. More on that in a bit. 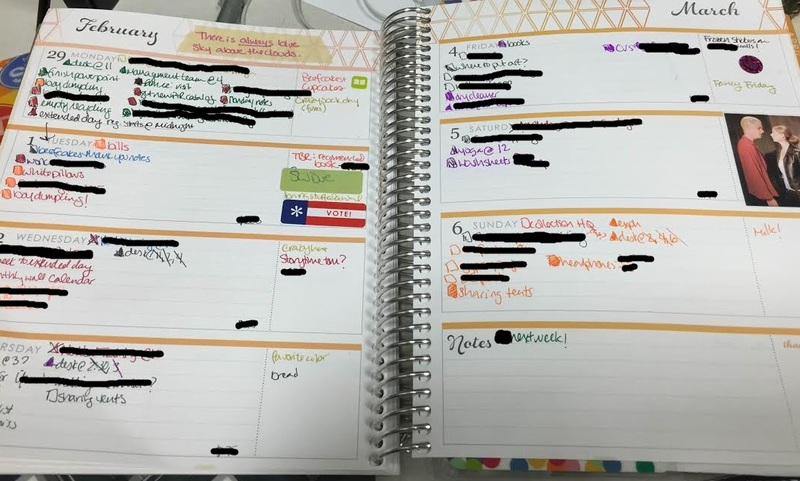 Some people use a lot of stickers and washi to make their planners very pretty. But I don't do a lot of this. If nothing else, I need to space to write down what I have to get done! I do use a few stickers on days I usually don't have much planned or a long to-do list (weekends) or to mark special occasions or events, because there are some really *great* stickers on Etsy and I couldn't resist. I also have a few motivational/inspirational quotes to get me going. The Erin Condren also comes with some stickers for scheduling that don't eat too much space. I don't need a lot of them (too many birthdays and mani/pedis, not enough doctor's appointments [being pregnant means going to the doctor A LOT] and none for meetings) but I like the blank ones (and you can order ones that say what you want them to say--I'm about to order some that say "meeting" and "review due" because those are things I use a lot). There are a few things I don't like. It turns out I used blank pages for notes and non-daily list things a lot more often than I thought. There are pages for notes at the end of each month, but it's not enough. I ended up buying a Moleskine Cahier to put in the included folder for longer notes and things. 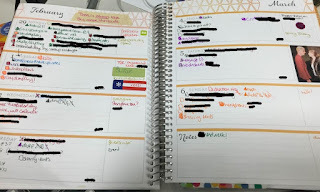 Sometimes it's a cumbersome work-around, sometimes it's helpful to see my notes and my daily task list at the same time--especially because I do a lot of project planning in my notebook, so I can see the smaller steps that are coming up and add them to my daily list without having to flip back-and-forth between pages. So, while this is working really well for me right now, we'll see if I stick with it--and that's my #1 favorite thing about Bullet Journal. It's perfectly customizable and adaptable, so if I think something else might work better as my work habits and circumstances change, I can find other ways to make Bullet Journal work for me then!